When a river swells with highwater in the spring it is usually due to snowmelt running out of the mountains. This melt water, hurried along by gravity, soon turns to a torrent gathering what ever is in it's way. Trees, trash, cows, houses, everything, tearing downhill like a wild beast, "out of control" as the damn builders would say. This is the way it's supposed to happen, but all too often in our day and age this annual wildness of the rivers is tamed by the placement of dams. 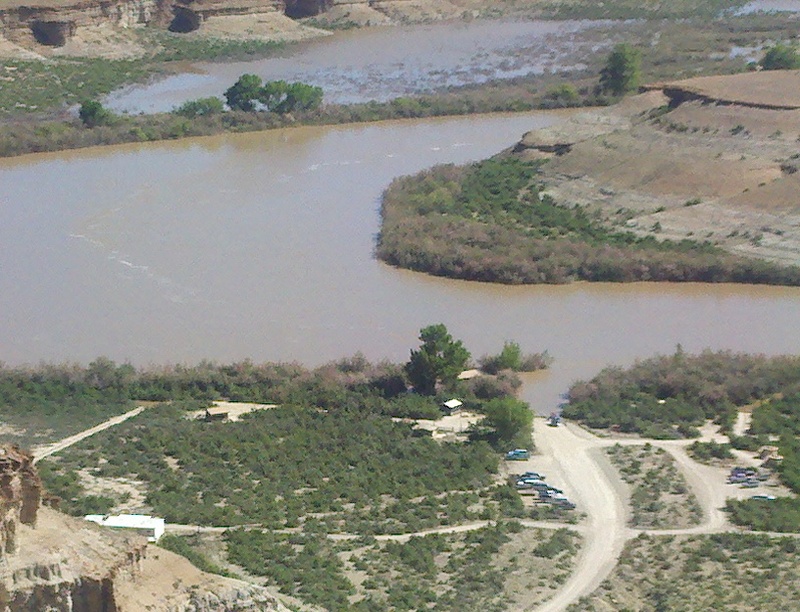 The Flaming Gorge dam on the Green River is a long ways upstream of Desolation Canyon. Far enough, actually, that the Green has a good chance of gathering it's steam again, with some help, before it flows into Desolation Canyon. The "help" of which I speak is that of the Yampa river. The Yampa is not dammed, or damned, however you choose to look at it, therefore, the wildness of the Yampa's water is intact, and tearing downhill like a wild beast, when it collides with the Green at Echo Park. The wildness that the Yampa gives the water in the Green is a very special thing about the Green River in Desolation Canyon. The river water is wilderness. 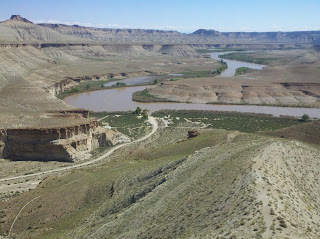 I launched a trip on the Green River through Desolation Canyon on 6-9-11 at ~40,000cfs and took out on 6-14 at ~52,000cfs at Swaseys boatramp north of Green River, Utah. Those numbers are adjusted to make up for the irrigation diversion that occurs a few miles upstream of the USGS gauge at Green River. The diversion includes a diversion canal on river right near Tushar Wash, and a new project on river left that was completed in 2009. 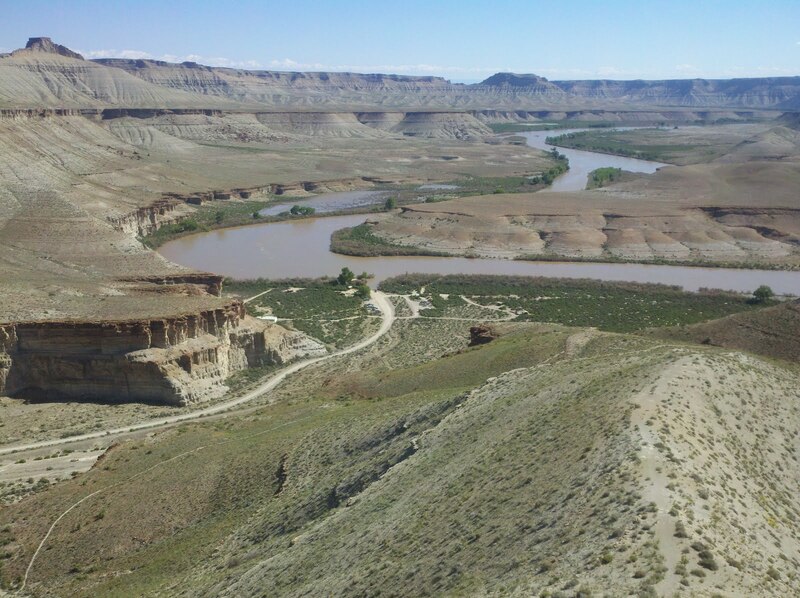 The project on river left diverts water to new irrigation projects, and to the recently relocated uranium tailings project near Thompson Springs, Utah. The numbers that I have come up with are arbitrary, but they are based on my observations of the past ten seasons in Desolation Canyon where I have rowed river flows between 650cfs in 2002 to over 50,000cfs this year, and lots of different river levels in between. People have been rowing boats down the river, through Deso, for the fun of it for a long time. Never in that history have they rowed boats on a river flow quite this high and fast. It was close in '83 and '84 with flows around 44,000cfs. 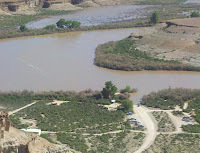 I thought I'd post some photos and videos of campsites and rapids with the estimated flows to hopefully show the character of the river during this unusual period of highwater. I have tried to include boats or something for scale, but as always, the camera just doesn't do justice. Particularly to the fascination that I felt during this last trip, but I'll try anyway. You may click on any photo to make it extra big. Skiff Site: ~40,000cfs: Flooded in about 2 feet of water. Webbing bowline tied to prow. Half full of water and floating. I thought the character of the river was fascinating in several ways. The current was very fast and nearly from bank to bank. When there were eddies they were nothing I wanted to place my boat into. Most had aggressive eddy fences and were full of the surging weight of 50' drift logs. There was wilderness in the water, and it scared me, but it made me smile. There were eddies within eddies that made trying to read the water a full time chore. Inevitably, I would still occasionally get an oar violently ripped out of my hand. Some of the eddy fences, like at Dripping Springs, were 6 or 8 feet high and easily big enough to flip a raft. I didn't think things were washed out, as I've heard in the past the river gets at high water. Waves were not as numerous, but when they were there they were big ocean looking swells followed by building and breaking wave trains, with awful eddies full of debris on each side. Some of the biggest rocks in the river corridor such as at Moonwater, Joe Hutch Creek, Wirefence, and Jacks Rock, were under fascinating amounts of water, creating terrible looking hydraulic holes as big as a greyhound bus lying on it's side. I noticed that while camping below rapids, and watching the river, it appeared that the water piled up in the middle of the river, below the rapid, like there was too much of it to flow downstream at one time. As I spend my years in Desolation Canyon it has begun to occur to me that my relationship with Deso is reciprocal. The river and the canyon brings me much joy. This trip, while I slept on it's shore, I could feel the vibration of the river, through the earth. It seemed to me that the river was having fun; like it was experiencing much joy. It was in full regalia, and proud of it's splendid majesty, and I was proud of the river. In a way that took some imagination I felt like John Wesley Powell floating downstream "at the speed of galloping horses, knowing not what lay around the next bend". Great report, pics and video Mick. Thank you so much for sharing these - we've never seen Deso this high & have a launch a couple of weeks after yours. We're guessing it'll still be in the 30's, hopefully high 30's. I've seen it at 27K, but it's sure nice to see what it looks like at 50's. This ought to make the bugs happy!